On Oct. 18, a rickety boat emitted signals of distress from the Sunda strait, a body of water sandwiched between the Indonesian islands of Java and Sumatra. Local authorities had no vessels in the area, and called on Australia for assistance. When H.M.A.S. Armidale, an Australian naval ship, approached the troubled craft, they found 78 Sri Lankan Tamil asylum seekers heading for Australia. Unsurprisingly, their wooden boat was not seaworthy, and those on board were transferred to the Oceanic Viking, an armed patrol vessel used by Australian customs to track poachers of the highly endangered Patagonian toothfish in these waters. In the last month, Australia has been grappling with a rising number of asylum seekers making their way to its shores via Indonesia. Around the time that the Tamils were being transferred to the Ocean Viking , another wooden boat carrying 255 Australia-bound Sri Lankan Tamils was intercepted by the Indonesian navy. The ship is now docked in the Indonesian port of Merak, and for three weeks its passengers have refused to disembark. On Nov. 2, another boat capsized near the Cocos Islands, a tiny set of Australian-owned atolls in the Indian Ocean. By the end of the day, 19 male survivors age 20-40 had been rescued, and up to 18 men were believed to still be missing. It remains unclear whether the victims were refugees heading for Australia, but their numbers and the quality of their boat suggested that they were. Intercepting asylum seekers arriving by boat from Indonesia has become routine for the Australian navy since Australian Prime Minister Kevin Rudd snuffed out the Pacific Solution in 2007. 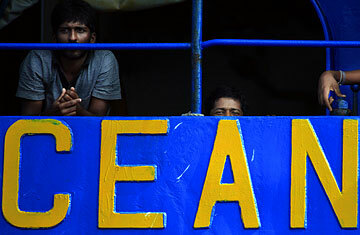 This year, more than 1,700 people have arrived by boat to Australia, compared to 161 last year. The opposition Liberal Party of Australia attributes the rise in asylum seekers directly to Rudd's new policies, saying that looser laws are encouraging more refugees to head Down Under through human-smuggling rings in Indonesia. They point to the fact that Rudd sped up the processing for protection-visa applications, and has guaranteed permanent residency to the successful applicants; Rudd has countered that outside 'push factors,' including regional conflicts in Sri Lanka and Afghanistan, are responsible for the surge. But the events of the last month have drifted into uncharted territory. And on Oct. 20 Rudd and Indonesian President Susilo Bambang Yudhoyono allegedly penned a deal, rumored to cost Australia $45 million, which would keep asylum seekers heading to Australia detained in Indonesia. The deal is dubbed by Australians as the Indonesian Solution, and many are unhappy that Indonesia is doing Rudd's dirty work. Following a personal plea from Rudd last month, Indonesian President Susilo Bambang Yudhoyono gave the Oceanic Viking the green light to disembark in Indonesia. It was taken to Bintan Island, where an Australian-funded detention center was awaiting the refugees. But on its arrival, Ismeth Abdullah, the area governor, told the press that his province was not "a dumping ground" for the asylum seekers and would not allow the ship to off-load. He later said that the island would accept the refugees provided they didn't stay longer than a month. The asylum seekers, for their part, also refused to disembark unless they were promised entry to Australia. Two weeks, two hunger strikes and several suicide threats later, the Tamils on the blue and yellow Oceanic Viking are still waiting off the coast of Bintan. The ship, registered to carry 75 passengers, now has over 110 on board, including customs officials. Indonesia has given the ship until Nov. 6 to leave international waters. No country wants the public relations nightmare of physically forcing the refugees from the boat. Indonesia lays the responsibility squarely on Australia's shoulders, and Australia says the refugees, who were found in Indonesia's search-and-rescue area, are Indonesia's problem. "I think the government foolishly created an embarrassing situation for itself," said Lindy Edwards, a political scientist at the Australian National University. "They have gone and generated the standoff that they can't back down." The 255 refugees on the ship in Merak are also stuck in limbo: they have one toilet between them, and the 17 children on board are said to be suffering from malnutrition. Those with mobile phones have called reporters to say that they have papers to prove their refugee status. As the standoffs continue, Rudd's constituency grows more divided between urging a peaceful solution and a full military intervention. Some have speculated the stalemate could mean political fallout for the relatively new Prime Minister, but Rudd told reporters in Townsville on Nov. 2 that he plans to stay the course. "This is a very hard area for government, but our job is to implement a responsible policy in the national interest," he said. It's just unclear which part of the nation he is referring to.